The triceratops, proper, didn’t exist? I first stumbled upon the misleading headline “Triceratops Didn’t Exist” on the Huffington Post at about 2:30 PM today. It has since been edited, but, like many articles on websites produced to procure hits, I was gullible enough to click on the link thinking the triceratops was just some fanatical creation. The article, by Bianca Bosker, contained information from this article by Graham Lawton of New Scientist, which clarifies the situation in a very concise manner: the triceratops is now believed, by two scientists Scanella and Horner of the Museum of the Rockies, to be the juvenile form of a dinosaur named the torosaurus. According to Lawton, the two scientists studied various torosaurus and triceratops skulls and determined that the triceratops incurred physical changes in its skull. 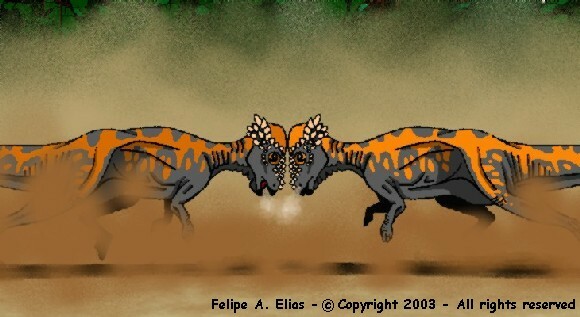 The Pachycephalosaurus, hater of Jeeps. This isn’t the first time dinosaurs were thought to have shape-shifting capabilities: the Dracorex and Stygimoloch both are believed to be juvenile forms of the pachycephalosaurus, who is best known for ramming the Jeep in Jurassic Park 2. One of the things that really amazes me about paleontology is the requirement of its scientists to piece together what we have in terms of fossils a picture of what ancient animals look like in spite of the fact that we have never seen them. Although, after seeing renderings of both the triceratops and the torosaurus, it becomes easier to see how the two would be related. What we knew as the triceratops, now known as the adolescent triceratops. What is now the triceratops, the former torosaurus. Pretty similar, eh? If the discovery holds up, it is anticipated that the torosaurus will be renamed the triceratops based on the taxonomic tradition of the triceratops being identified first, thus the name will be kept. Goji berry update: I have not turned into Kellan Lutz yet. Oh well. ‹ PreviousAccidental caffeine freak out. Next ›There is a pumpkin growing in my driveway.